The oldest of 11 children in a family of migrant workers, Albert Garza Bustamante was born April 8, 1935, in Asherton, Texas. As a child, he picked crops with his family in Oregon from May to September. “I know the vicious cycle of migrant life,” he later recalled. “What we earned in the five months before returning to Texas in September had to support us the rest of the year.”2 Bustamante began school at age nine, speaking an “in-between Spanish dialect” and unable to read or speak English.3 Hampered by this late start, Bustamante struggled academically, but managed to graduate from Asherton High School in 1954. He joined the U.S. Army that same year, serving as a paratrooper until 1956. Bustamante attended San Antonio College from 1956 to 1958 before transferring to Sul Ross State College in Alpine, Texas. Financing his final semester of education with a $250 loan from a school janitor, he graduated with a degree in secondary education in 1961. Bustamante taught at Cooper Junior High School in San Antonio and coached football and basketball for seven years. He married Rebecca Pounders, and the couple raised three children: Albert, John, and Celina. In 1984 Bustamante took on Abraham Kazen, an 18-year incumbent, for a House seat representing the northwest San Antonio suburbs in Bexar County. The diverse district included many middle-class, primarily white communities outside the city as well as the rural, mostly Hispanic towns near Laredo, on the Mexican border. Though its voters leaned Democratic, socially conservative Hispanics as well as a large military presence from several nearby air force bases generally made the district more competitive.6 Bustamante’s greatest obstacle proved to be the Democratic primary race against the entrenched incumbent. Bustamante criticized what he said were Kazen’s scarce accomplishments during his long career, playing up his ethnicity and the possible increase of Hispanics in Congress. This strategy was particularly effective since the primary fell on Cinco de Mayo (May 5), the widely celebrated date of Mexico’s victory over French invaders in 1862. “Help me on Cinco De Mayo to declare our independence from an old political family who has controlled the destiny of this area,” he told a crowd of Hispanic voters.7 Bustamante upset Kazen in the Democratic primary, winning every county in the district and taking 59 percent of the vote to his opponent’s 37 percent. He was unopposed in the general election. 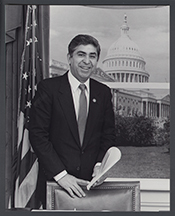 When Bustamante arrived in Washington in 1985, he was elected president of his Democratic freshman class. He was the first Hispanic to be so honored.8 During his first term he also received a position on the Democratic Steering and Policy Committee, which assigned committees and set party policy. Bustamante was assigned to the Government Operations and Armed Services Committees, on which he served his entire congressional career. The latter proved beneficial for serving the large military population in his district. In his final two terms Bustamante also served on the Select Committee on Hunger. Bustamante warily supported increased military spending. Though he favored projects that positively affected the military bases in his district, he often voiced concern about their impact on the environment and about the safety of nuclear production plants.28 Because Bustamante served on two subcommittees that oversaw the manufacture of nuclear power and weapons—Procurement and Military Nuclear Systems (Armed Services Committee) and Environment, Energy, and Natural Resources (Government Operations)—he had a platform from which to critique the management and proliferation of such facilities. In 1988 he noted the ailing Savannah River weapons plant in South Carolina “has been living on the edge of a major disaster for 30 years” when fires, equipment failure, and plutonium leaks inspired an investigation by the Department of Energy.29 Bustamante eventually supported closing the Savannah plant and other plants, castigating the oversight committees for their lack of action regarding faulty facilities. “The Armed Services Committee has done very little,” he scolded. “Anytime we get into a problem … nobody on the committee knows what is what. We just delegate things to the Department of Energy,” which he noted was already stretched thin having to regulate 17 plants across a dozen states.30 In 1987 and 1988, Bustamante supported the Nuclear Test-Ban Treaty amendments put forth by liberal Democrats. 1David S. Broder, Changing of the Guard: Power and Leadership in America (New York: Penguin Books: 1980): 286. 2Spencer Rich, “The Cutting Edge: Migrant Workers Suffer Nutritional Deficiencies,” 11 April 1989, Washington Post: 5. 3Broder, Changing of the Guard: 286. 5See, for example, Broder, “Texas, Vital to a Carter Victory, Presents Many Obstacles,” 14 September 1980, Washington Post: A2; Rowland Evans and Robert Novak, “Keeping Glenn Moderate,” 13 July 1983, Washington Post, A19. 6Almanac of American Politics, 1986 (Washington, D.C.: National Journal Inc., 1985): 1339. 7Politics in America, 1990 (Washington, D.C.: Congressional Quarterly, Inc., 1989): 1493. 8"Minority Reports," 16 December 1984, New York Times: E20. 9Antoinette Sedillo Lopez, ed., Latino Communities: Emerging Voices (New York: Routledge, 2002): 102. 10Broder, Changing of the Guard: 286. 11For more information on the Hispanic Caucus’s perspective on Central American policy, see Antonio González, “Chicano Politics and U.S. Policy in Central America, 1979–1990,” in David Montejano, ed., Chicano Politics and Society in the Late Twentieth Century (Austin: University of Texas Press, 1999): 154–172. 12Politics in America, 1990: 1493. 13Congressional Quarterly Almanac, 1985 (Washington, D.C.: Congressional Quarterly, Inc., 1986): 22-H–25-H; Congressional Record, House, 99th Cong., 1st sess. (23 April 1985): 9085–9086; Congressional Record, House, 99th Cong., 1st sess. (24 April 1985): 9255–9257; Jacquelyn Swearingen, [No title], 23 April 1985, State News Service. 14Bustamante voted with President Reagan in all five crucial votes on the bill that took place June 12. Congressional Record, House, 99th Cong., 1st sess. (12 June 1985): 15419–15420, 15431, 15436–15437, 15466, 15468–15469; Congressional Quarterly Almanac, 1985: 46-H–49-H.
15Jacquelyn Swearingen, [No title], 12 June 1985, State News Service. 16Jacquelyn Swearingen, [No title], 19 March 1986, State News Service. 17Robert Parry, “Centrist Democrats Seek Delay on Contra Aid,” 3 February 1986, Associated Press; Edward Walsh and Milton Coleman, “Reagan Twists Arms as Aides Seek Pact on Aid to Contras,” 19 March 1986, Washington Post: A27; Lea Donsky, “Contra Deal Rides on a Few Votes,” 18 March 1986, Chicago Tribune; Swearingen, [No title], 5 June 1986, State News Service. 18Congressional Record, House, 99th Cong., 2nd sess. (20 March 1986): 5770–5771; Congress and the Nation, 1985–1988 (Washington, D.C.: CQ Press, 1990): 178. 19Congressional Record, House, 99th Cong., 2nd sess. (25 June 1986): 15562–15563; Linda Greenhouse, “Lobbying Succeeds,” 26 June 1986, New York Times: A1. 20Edward Walsh, “House Reverses Vote, Approves Reagan Plan for Aid to the Contras,” 26 June 1986, Washington Post: A1. 21Karen Tumulty, “House Votes to Bar Funds for Contras,” 12 March 1987, Los Angeles Times: 1. 22R. W. Apple, Jr., “North Role Cited in Bid to Unseat Contra Aid Foes,” 15 December 1986, New York Times: A1; Congress and the Nation, 1985–1988: 211; Congressional Record, House, 100th Cong., 1st sess. (11 March 1987): 5467. 23See, for example, the final vote on H. J. Res. 484, Congressional Record, 100th Cong., 2nd sess. (3 March 1988): 3257, and the amendment proposed by Henry Hyde of Illinois to H.R. 4387. See Congressional Record, 100th Congress, 2nd sess. (26 May 1988): 12526. 24Congressional Record, House, 99th Cong., 2nd sess. (9 October 1986): 30075–30076. 25See, for example, Congressional Record, House, 99th Cong., 2nd sess. (9 October 1986): 26403, 31644; Robert Pear, “Immigration Bill: How ‘Corpse’ Came Back to Life,” 13 October 1986, New York Times: A16. 26Congressional Record, House, 99th Cong., 2nd sess. (9 October 1986): 30051. 27Robert Pear, “Study Finds Bias, Forcing Review of 1986 Alien Law,” 30 March 1990, New York Times: A1. 28Richard Haller, “Budget Cuts? ‘Not in My District!’,” 11 February 1988, New York Times: A20. 29Keith Schneider, “Inquiry Ordered at Nuclear Arms Site,” 7 October 1988, New York Times: A18. 30Fox Butterfield, “Trouble at Atomic Bomb Plants: How Lawmakers Missed the Signs,” 28 November 1988, New York Times: A1. 31Jonathan Moore, “Bustamante Warchest Larger Than Bonilla’s,” 3 June 1992, State News Service. 32See, for example, Jennifer Dixon, “Bustamante Says FBI Questioning People about His Links to Bingo,” 6 December 1990, Associated Press; Hugh Aynesworth, “Bustamante Calls Probe GOP Political Vendetta,” 1 October 1992, Washington Times: A5. 33See, for example, Karen J. Cohen, “Rep. Bustamante Has No Problems with Releasing Names in the Check-Cashing Scandal,” 11 March 1992, State News Service; William E. Clayton, Jr., and Damon Gardenhire, “House Unmasks Check-Kiters; Names of 21 Texas Members Listed in ‘Rubbergate’ Report,” 17 April 1992, Houston Chronicle: A1; Dante Chinni, “3 Texans Unable to Shake House Banking Scandal,” 10 October 1992, Houston Chronicle: A4; Dante Chinni, “3 in Check Case Hope the All-Clear Really in the Mail,” 31 October 1992, Houston Chronicle: A16. 34Hugh Aynesworth, “Bustamante Calls Probe GOP Political Vendetta,” 1 October 1992, Washington Times: A5; Almanac of American Politics, 1994 (Washington, D.C.: National Journal Inc., 1993): 1263. 35James Rubin, “Scandal the Deciding Factor for Many of Congress’ Losing Incumbents,” 4 November 1992, The Associated Press. 36Bustamante’s wife, Rebecca, was also charged with seven counts of bribery. She was acquitted on all charges. See, for example, “Ex-Congressman Indicted on Charges of Accepting Bribes,” 19 February 1993, New York Times: A11; Federal Jury Convicts Ex-Texas Congressman, 22 July 1993, New York Times: A21; “Ex- Congressman Is Sentenced,” 2 October 1993, New York Times: 9. 37University of Texas at San Antonio, Archives and Special Collections, “A Guide to the Albert Bustamante Papers, 1980–1992,” http://www.lib.utexas.edu/taro/utsa/00006/utsa-00006.html (accessed 14 July 2009). Videocassette: 1984, 5 commercials on 1 videocassette. The commercials were used during Albert Bustamante's campaign for the 1984 U.S. congressional election in District 23 of Texas, Democratic Party. Papers: 1980-1992, 13 boxes, 5 feet 2 linear inches. The collection documents Albert Bustamante's career from 1980-1992 as a Bexar County Judge and as a U.S. Congressman. The bulk of the collection consists of incoming and outgoing correspondence from constituents and colleagues. The remainder of the records compile Congressman Bustamante's legislative record through vote books, a legislative profile and his weekly newspaper column. The collection is divided into two series: papers from his terms as a Bexar County Judge and as a U.S. Congressman. A finding aid is available in the repository and online. "Albert G. Bustamante" in Hispanic Americans in Congress, 1822-2012. Prepared under the direction of the Committee on House Administration by the Office of the Historian and the Office of the Clerk, U.S. House of Representatives. Washington: Government Printing Office, 2013. De La Garza, Rodolfo O., and Louis Desipio, eds. Ethnic Ironies: Latino Politics in the 1992 Elections. Boulder, Colo.: Westview Press, 1996. Rodriguez, David. Latino National Political Coalitions: Struggles and Challenges. New York: Garland Publishing, 2000.